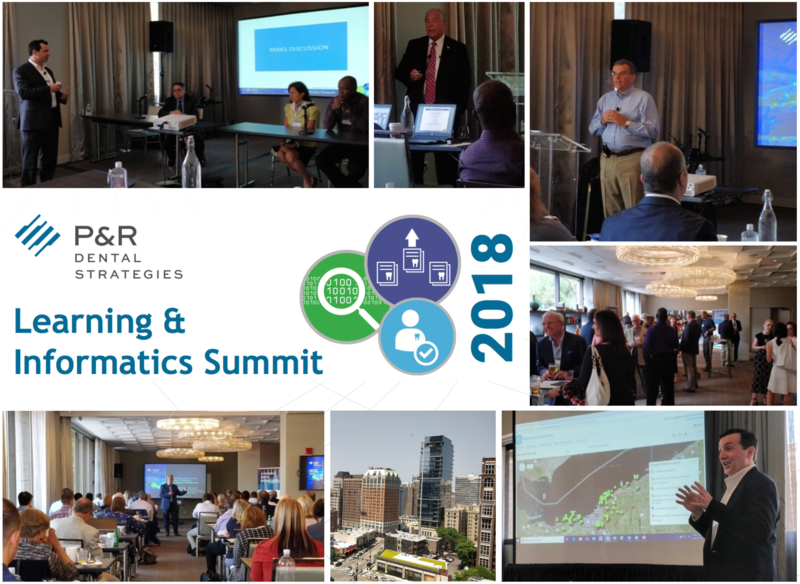 Over 30 organizations joined P&R Dental Strategies in Chicago to explore new data-driven solutions to today’s biggest challenges facing dental payers, third party administrators and benefits consultants. CHICAGO, IL, June 27-28, 2018 — P&R Dental Strategies, LLC, the premier dental insights company delivering customized, actionable business intelligence to support a variety of dental payer objectives, announced today that its third annual Learning & Informatics Summit concluded with a record number of payer organizations, third party administrators, benefits consultants and dental thought leaders in attendance. The two-day Summit was a resounding success, filled with insightful presentations, engaging discussions, educational workshops and excellent networking opportunities at The Thompson Hotel in downtown Chicago. The morning keynote address was delivered by Dr. Lynn Douglas Mouden, Vice President & Dental Director, Quality and Performance at Avesis Incorporated, and formerly the Chief Dental Officer of the Centers for Medicare & Medicaid Services (CMS). Dr. Mouden provided illuminating insights into the history and current status of the dental benefits market together with a fascinating perspective on current dental policy in the government market. The lunchtime keynote speaker was P&R’s longtime academic partner, Dr. Juan F. Yepes, Associate Professor, Department of Pediatric Dentistry at the Indiana University School of Dentistry, who presented the results of his groundbreaking studies on the use radiological exams in pediatric dentistry. Dr. Yepes’ studies analyzed millions of records from P&R Dental Strategies’ multi-payer claims database, DentaBase®. The Summit included presentations by the talented P&R team on the latest dental market trends, new tools for fighting outlier abuse, a robust panel discussion on creative new initiatives in dental quality measurement and in-depth tutorials by Paul Golder, P&R’s Director of Account Management, on the latest enhancements to P&R’s industry-leading Utilization Management Module™ and Network Development Module™. Work has already begun on the 2019 Learning & Informatics Summit. Stay in the know on the latest updates by following P&R Dental Strategies on LinkedIn and Twitter. If you’d like to view the archive of this year’s Summit presentations, explore the latest DentaBase® trends and stay updated about future Summits, email insights@pandrdental.com to request access to our new Learning & Informatics Discovery Hub.